We hope that you do find this information useful! Please feel free to contact us if you need any more information, or to suggest anything else which you think should be on this page. School uniform is important because it helps pupils to feel part of our school community. It averts the 'best-dressed' competition which can happen among children, allowing them instead to focus attention on their learning - and on developing a positive attitude towards their schoolmates' personalities rather than appearance. It provides a positive, cohesive image for our school. School uniform is available to purchase from our school office. We do only have a limited stock, but we can order uniform for you. You can also order directly from our supplier Andrew Hyde (www.ahyde.co.uk), although this does incur a £3.00 delivery charge. Please ensure that your child's name is written on tags inside their uniform/PE kit/coat/etc. so that any lost property can be returned to its owner. 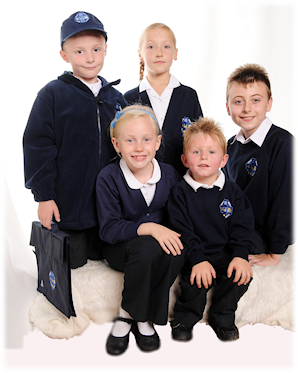 We have a supplier who can tailor-make the 'iron-on name labels' for school uniform. More details can be found at www.labelcreating.co.uk. Shirts/polo shirts: plain white or light blue, preferably with the school logo. Trousers: plain black; not jeans, leggings or track/shell-suit bottoms. In summer, black ¾-length shorts can be worn. Skirts: plain black; tights (if worn) should be plain black or dark blue. Pinafores: blue and white check. Sweatshirts/cardigans: dark blue, preferably with the school logo. Shoes/trainers: black with black laces. In winter, children may wear boots. In summer, children may wear sandals. Lower school children (KS1 and EYFS): plain white T-shirt. Upper school children (KS2): team-coloured T-shirt, preferably with the school logo. Dark blue/black shorts or PE skirt. 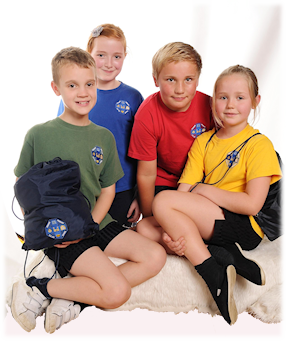 In winter, children may wear tracksuit bottoms for outdoor PE. Pumps, or trainers with non-marking soles. Pupils are allowed to wear a watch and one earring in each ear. For health and safety reasons, pupils must remove all jewellery for PE lessons and sports clubs, and new or existing piercings cannot be taped over. If your child cannot remove their earrings for PE, they cannot participate in physical activities. This is for their safety and the safety of other children. Make-up and extreme hairstyles are not allowed. You can choose for your child to have a school meal or bring a packed lunch to school. Our healthy school meals are prepared, cooked and served on-site. See Derbyshire County Council's 'My School Lunch' page for menus and nutritional information. Children from Reception through to Year 2 are entitled to a universal free school meal. You can choose for your child to have a school meal or packed lunch on different days of the week (e.g. school meal on Mon, Tue, Wed; packed lunch on Thu and Fri), but our kitchen staff need to know your child's requirements at the beginning of the week so that they can organise their food orders. We must be informed on the Monday of each week what your child's lunch requirements are, please. Dinner money should be sent in on a Monday for the whole week, in a named envelope, and given to your child's teacher. If a child is absent during a week they have paid for, their unspent dinner money will be carried over to the following week. Dinner money is £2.10 per day. In these difficult times, we want to make sure you're getting all the help you're due. A lot of people don't claim free school meals - even though they're entitled to! That's why Derbyshire County Council has launched the 'Quids In' campaign, to encourage people to check whether they're eligible. You don't need to worry about other parents or children knowing that your child gets free school meals. Only the school and catering staff will know. You could save up to £400 a year for each child, and your children could benefit from a good hot meal at lunchtime. Our school will benefit too - we'll get the pupil premium of £1320.00 per year from the government for each child on free school meals. Parents who are eligible for free school meals due to their personal circumstances need to notify school and complete the relevant paperwork - especially if they have older children in school. It is essential that you please notify the school office if you are eligible for free school meals. We currently receive £1320.00 per free school meal child. This additional funding is essential in providing expert one-to-one/small-group tuition and extra Teaching Assistant support throughout the Key Stages. It also helps to pay for curriculum enrichment such as theatre trips and events held in school - but we only receive this if parents complete the necessary paperwork. Please register for free school meals even if your child has a packed lunch. Alternative ways to apply are by phoning 01629 536400/535743, by email at checking@derbyshire.gov.uk, or at www.derbyshire.gov.uk/freeschoolmeals. Codnor Community Primary School has nine classes in total, including its own Nursery. Nursery and Reception are known as the Early Years Foundation Stage (EYFS). Year 1 and Year 2 form Key Stage One (KS1) and Year 3 to Year 6 form Key Stage Two (KS2). Please see our Who's Who page for information about staff members who teach each year group. Morning nursery 08.30 - 11.30 a.m. Afternoon nursery 12.30 - 15.30 p.m.
For safety and safeguarding reasons, parents/carers are asked not to leave their children unattended in the playgrounds, on the school field, or around the entrances to school before 8.45AM as there is no official supervision before this time. The gates on Bakers Lane and into lower school are locked at 9.15AM, and not reopened until 15.00PM. The only access to school between these times is via the main entrance on Whitegates. If children arrive late, they must report directly to reception from the main entrance. Please note that the upper school playground gate is not opened to parents and children until 8.30AM. Nursery morning and afternoon children leave school via the Nursery entrance. Reception, Y1 and Y2 children leave school via the lower school entrance. Y3 and Y5 children leave school via the upper school door next to the field. Y6 children leave school via the main entrance. Mr Buckle's Y4 children leave school via the main entrance. Mrs Goodburn's Y4 children leave school via the upper school door next to the field. Children attending after-hours clubs and tuition leave school as specified on their After-Hours Arrangements Form. During school hours, children are under supervision when using the grounds and equipment. Appropriate risk assessments are in place and we have staff trained in first-aid, in case a child has an accident. We cannot supervise children once they have been dismissed by their teacher or after-hours group leader. Outside of school hours, children are the responsibility of their parents/carers. The trim trail on the school field has been designed for junior-aged children and is therefore not recommended for children under seven years of age to use unsupervised, due to its height and structure. If you allow your child to use the equipment after school hours (e.g. when collecting them at the end of the school day), it has to be at your own risk and responsibility. Our highest priorities are the safety, wellbeing, happiness and academic progress of our children. If you would like discuss any aspect of your child's education - or if you have any concerns - your child's class teacher will be happy to meet with you. If the matter is not urgent, the end of the school day is preferable, as class teachers may have morning duties or may need time to prepare for their lessons. Some pupils may need medication during school hours. In circumstances where children need medication regularly, a health-care plan is drawn up to ensure the safety and protection of pupils and staff. Children should be taught to self-administer medication such as ointment, sun cream and inhalers. If school staff need to be involved in this, arrangements will need to be discussed and assessed on an individual basis. All medication should be presented to the school office and the necessary forms completed and signed by parents. These forms give consent for the administration staff to administer the appropriate medication and dosage as instructed by the parent. All medication must be clearly labelled with the name of your child, including the bottle and packaging. The parental consent form is retained in the school office along with the medicine, which should be collected by parents at the end of the school day if required. All children with any medical needs/issues are recorded in school and information given to every class teacher. Children who require medication due to severe allergies, e.g. Piriton or Epipen, have an individual health-care plan and their medication is kept in a secure place of which all staff are aware. Seven members of staff have also received in-house Epipen training with a specialist nurse from Sherwood Hospital NHS Trust, and more recently some additional refresher training from our School Nurse. Several staff in school have also recently received diabetes training from the Royal Derby Hospital and first aid certificates (including paediatric first aid) are renewed every three years with the training provided by St John Ambulance. We have a number of inhalers for emergency use in school. These are there as a 'standby' in case an inhaler has not been brought into school, or a child's own inhaler runs out. All parents who have indicated that their child has asthma (and that their child uses an inhaler in school) have been written to, and consent obtained for children to use an emergency inhaler if required. For our children's safety, all entrances to the site and common outdoor areas are monitored and recorded by CCTV cameras. Access to the school building is restricted by coded keypads. External gates (e.g. Bakers Lane gate and lower school gate) are locked once school is in session; the only access to the site after this time is via the main entrance on Whitegates. Visitors report directly to reception from there. CCTV data is retained securely and is only stored on-site, with high measures of password-protected security. There are legitimate reasons for some pupils bringing mobile phones into school. Children who walk to school, for example, can carry a phone to help ensure their safety on the streets. If pupils do bring mobile phones to school, their phones must be switched off and taken to the office, to be collected at the end of the day - not kept in pupils' bags. We regret that we cannot allow pupils to bring mobile phones (or any other technology with the capability to record) to after-school events, e.g. school discos. Nor are we responsible for any loss/damage. We do support parents who like to make recordings of events such as nativities - they are lovely memories of their children growing up - but this is on the understanding that these recordings are strictly for parents' personal use and are not shared on social media in any form. Please do not bring dogs onto the school grounds. We know that most dog owners are responsible and take care to control their dogs. However, the behaviour of dogs when in close proximity to other dogs and small children can be unpredictable. The nature of a school at busy times is such that over-excitement is much more likely to occur than generally would be the case. No-one can be absolutely certain how their dogs will behave in an environment as dynamic as a school playground, and the presence of dogs in this environment is potentially dangerous - even if they are carried in arms by their owners. With the exception of professionally-trained guide dogs/hearing dogs, we appreciate your co-operation in not bringing your dog onto school premises. Paths around the school site can be extremely busy - especially at the start and end of the school day. As such, it is unsafe for anyone to ride bikes, scooters, skateboards, etc. on the grounds (unless this is part of an activity controlled by school, e.g. Bikeability). As befits our status as a 'healthy school', we do encourage children to ride or walk to school rather than travelling in cars. For everyone's safety, however, anyone who arrives at school on a bike, scooter, skateboard, etc. must dismount before they enter the site.